1908 post card as Bijou Theatre added courtesy Walter Jung. 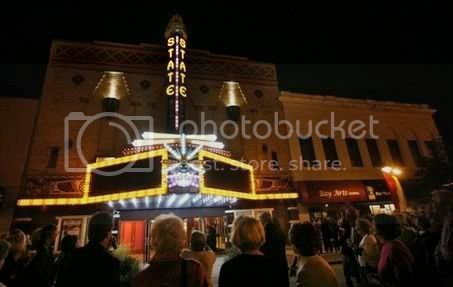 It shows how drastic the exterior remodeling was compared to the photos of it as State Theatre. Built in 1908 during the booming lumbering era in Michigan, the STATE Theatre was known as the BIJOU and was redone in 1930 by C. Howard Crane, who used local labor using hand-crafted plaster casts for the 9,500 square-foot theatre. As years passed and owners changed, the Mayan murals were painted over and water damage became evident. The Dow Chemical Company Foundation provided financial support for the restoration project. New Marquee is nice, but I like the old one better,but no one asked me. Sorry, but I think the original marquee was much nicer and historically significant. the new one is flashy but too plastic. Really would have loved to see a closer replica more true to the old “Bay” marquee, than this flashy digital animated thing. Yes, I’m a purist, but I really think this missed the mark. Well, I’d remove the post but there doesn’t seem to be a way to do it. I’ll just use links from now on. This was the old marquee as it looked in February 2007. Cool stuff! Thanks for posting and sharing it. Wish I could’ve seen what the inside of the theatre looked like, but I wasn’t able to link onto that particular link. It looks like a gorgeous theatre, though. BayCityJohn! I enjoyed your video very much and wanted to share the fact that my beloved Capitol theatre in London Ontario was also a C Howard Crane Masterpiece. I made a video of the histor of theatres in Bay City for the State Theatre. It’s on YouTube, in 2 parts. 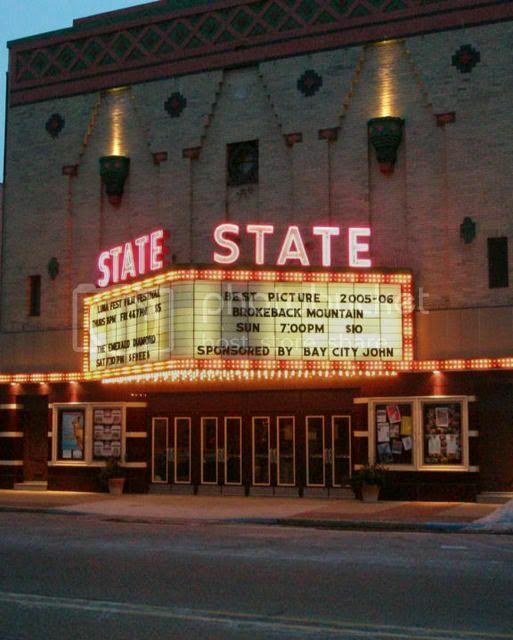 Here’s a few photos of the State Theatre after the renovation. Click on the thumbnails for larger pic. I’m sure the Mayan marquee will be cool. But that well-maintained 50’s marquee with it’s tracers is cool too. If they have other projects they might spend money on, I say leave the marquee alone! It’s glad to learn that the beautiful theatre can be renovated and open to business. 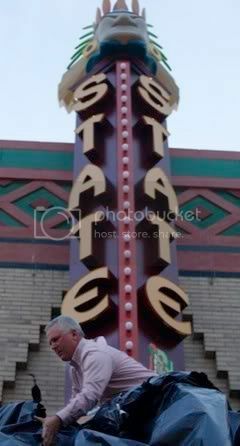 I was just inside the State Theater on Sunday 4/19/05. The rennovations are looking great. The entire interior should be restored by sometime in September ‘05. Future plans include restoring the '30’s mayan style marquee outside as well. inside, the Theater looks like a miniture version of the Egyptian in Hollywood (excpet, of course in Mayan theme, versus Egyptian) I spent many hours in the state as a kid in the 60’s and 70’s, with no idea the history that lay beneath a few coats of “Butterfield green and beige” paint.